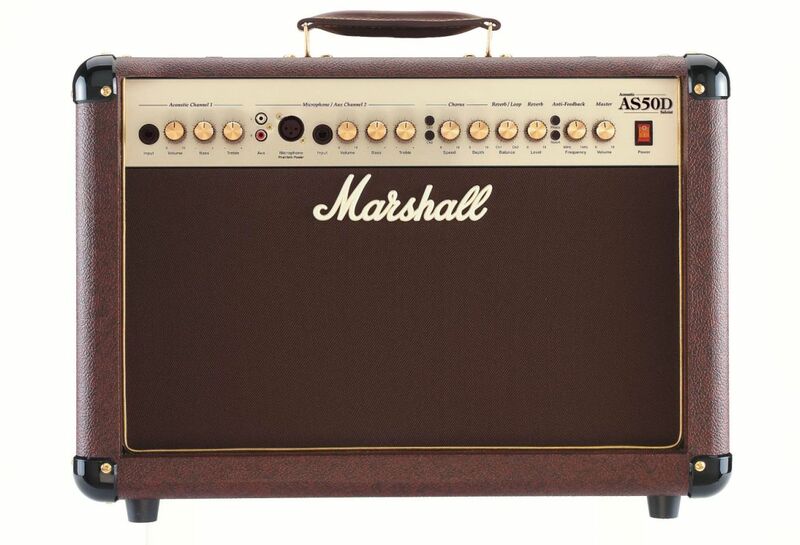 AS50D, Acoustic-Electric Guitar Amplifier from Marshall in the AS series. This is an acoustic guitar amplifier. It is a solid state amp. There are two channels. The first channel has a simple 1/4" input. The second channel has that input as well as an Audio input and an XLR input for a microphone (or an acoustic if you have that type of cable). There are 50 watts of power delivered to the amp. There is a two-band EQ on each channel (bass and treble). There is also a chorus effect that can be applied to either channel, as well as reverb which can also be added to either channel. The coolest thing here is the feedback eliminator, which can be adjusted to eliminate feedback in specific frequencies so as not to sacrifice tone. There is also a master volume control for both channels. I think this amp is pretty easy to use. I think that the chorus effect is downright a waste of time, and quite cheesy. Who wants an acoustic guitar to have chorus. The reverb fares a bit better but is still not my favorite. I think that the manual explains everything nicely, Marshall is usually pretty good about that. I wasn't crazy about this amp. I don't like solid states for electric guitars but I thought that they'd be better off for acoustics. I guess I was wrong. The chorus effect is god awful, I didn't expect much and it was still worse than I thought it'd be. 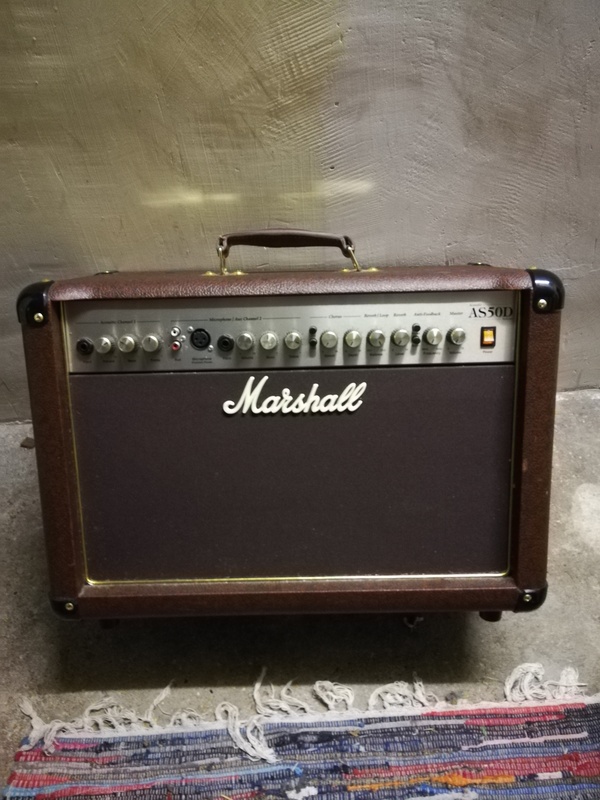 The sounds that came out of this amp were pretty stale to be honest, I think I've heard better sounds with a DI box and an amp modeler, which is scary. The only cool thing about this is the feedback eliminator but I have not usually had problems with feedback so I didn't get much use out of it. The reverb wasn't all that great, I like spring reverb in tube amps better. Mostly I just didn't get an amplified feel from this, I felt like I was running a DI to the PA. I guess this just wasn't the amp for me, if people want a really smooth acoustic sound than they might be more interested in this. For me, though, this just wasn't cutting it. I'll certainly not be regretting returning this guy so quickly. 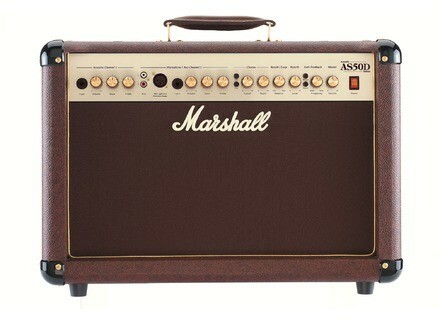 I had the chance to try home quietly Roland AC60 radiator1 Ashdown and the marshall AS50D. 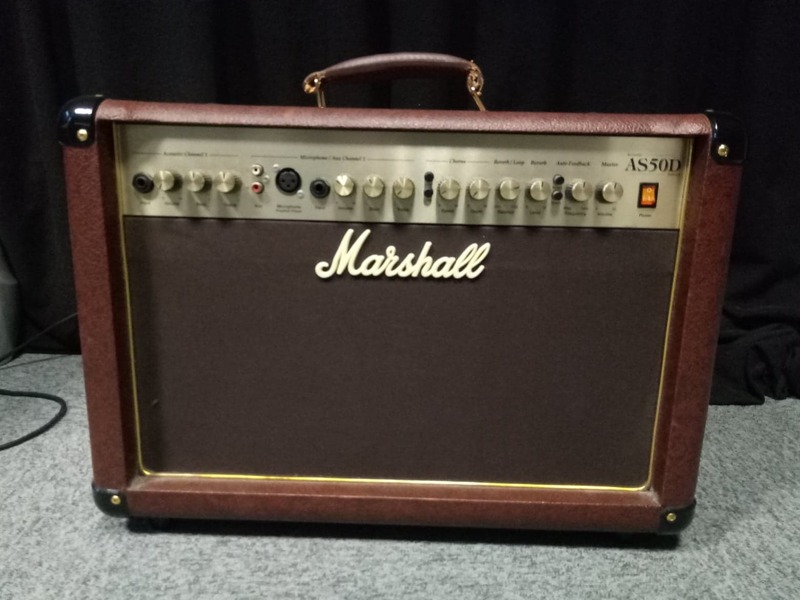 Ashdown: liminroland good but not dose the reverb on any channel, so advantage marshall with a preference for the playback sound for guitar AND the microphone. Very very good quality ratio prix.Look "pest" more than acceptable power equalizer medium but without very precise. Was hoping that might help you in your quest or consolidate! 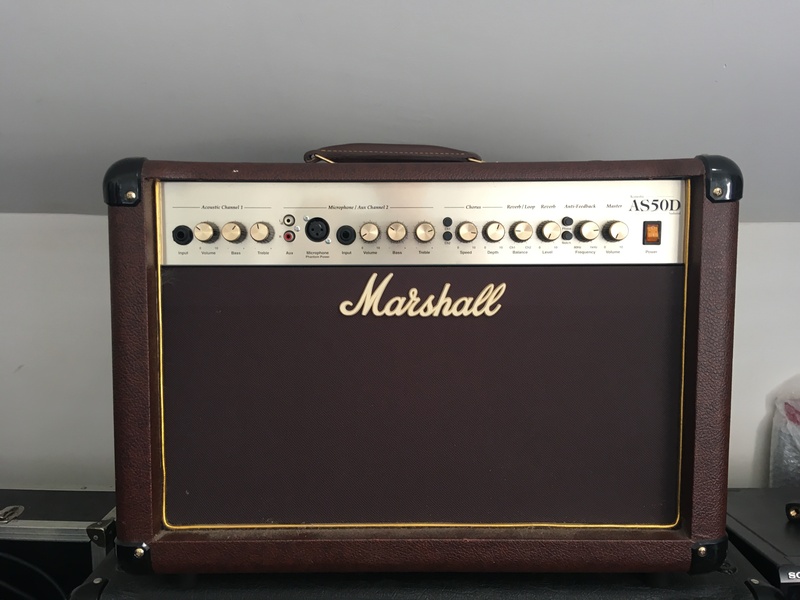 fafonite's review (This content has been automatically translated from French)" the must"
Marshall celebrates the 20th Anniversary of its AS50D acoustic-electric amp with a special edition with Cream tolex.